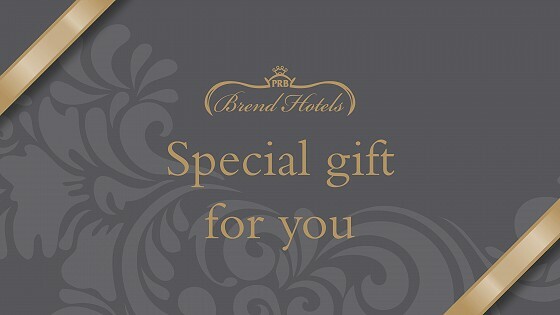 With the joy of Christmas building here at Carlyon Bay, we want to share with you the joys of giving a Brend Hotel voucher as a gift. We have the perfect presents for those who love our hotel, and for friends and family who have not visited us before - but you know they'll enjoy our hotel breaks, golf days, spa treatments and delicious dining options. Remove the worry and stress of finding a gift for a wonderful person. We’ve got an array of luxurious experiences that everyone will love. Your gift voucher can be sent by email or by post and can be personalised with a special message. Postal vouchers are presented in a wallet in a design of your choice with coordinating voucher enclosed. Vouchers can be sent to your own address or directly to a recipient, and you can select the date on which the voucher should be dispatched. They can be purchased online or at our reception desk, but not over the phone. They can be given to whoever you wish and can then be spent with us here in Cornwall. We will accept them to pay for (or contribute to) bookings and accommodation plus meals in our Bay View Restaurant, Taste Brasserie or Terrace Lounge. If you know someone who would simply love our hotel, or if you are aware of anyone looking for a break to a stunning location by the sea, this is the option for you. We have several special vouchers designed to treat someone very special who deserves to be pampered. The lucky receiver of this voucher will enjoy an Elemis Intensely Cleansing Full Body Salt Glow to buff away any impurities. Next, they'll be eased into a warming luxurious Lava Shell Full Body Massage, this is then followed by a choice of four Elemis anti-ageing facials using carefully chosen products to combat specific needs. For that final touch, tired feet will be nourished and softened with an express pedicure, complemented with an OPI polish and an Express Pedicure and Polish. There’s also a 15% discount off food and drink eligible to use at any of the bars and restaurants throughout the hotel. A spa day at Carlyon Bay is all about choice. We invite guests to sit back, relax and enjoy a range of treatments. Fluffy white robes and slippers are included on arrival and we'll give15% off any food and drinks and consumed on the day. Voucher users benefit from full use of the spa and leisure facilities, adding a half hour treatment with one of our spa therapists: an Aromatherapy back, neck, shoulder massage, Express Elemis Facial or OPI Express Manicure or Pedicure. A classic and legendary full body massage guaranteed to remove the stresses of life. With this voucher, the user can experience the benefits of the massage with the addition of individually chosen essential oils to suit their needs in one of the finest anti-stress treatments available. A tension relieving scalp massage is also included. Our twilight sessions run Sunday to Thursday, so if you know someone who's able to join us during the week to escape the rush of everyday life, this is an opportunity to treat them! 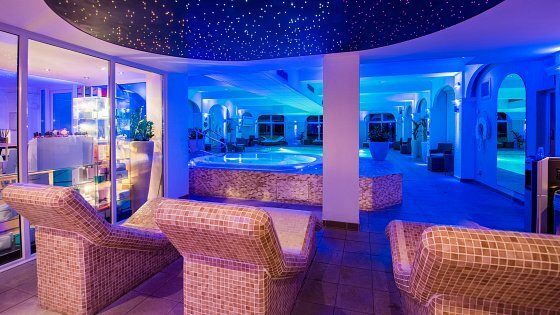 They will find themselves starting to unwind from the moment they wrap up in one of our complimentary spa gowns and slippers before a leisurely evening consisting of the full use of the spa and leisure facilities. Not sure which of the experience to purchase. Don't worry, simply give a voucher up to a total of £200 to be spent however the recipient wishes. It's the perfect treat as this gift voucher can be exchanged for (or contribute towards) a spa treatment, spa day or combination of both in the luxurious Carlyon Bay. 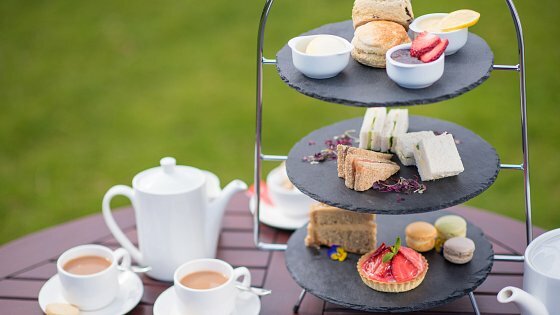 Afternoon Teas with Champagne for two costs a £55 voucher and can be held here at Carlyon Bay, ideal after a walk along the cliff top or around St Austell. Like above, but without the Champagne. Enjoy a delightful selection of finger sandwiches, warm scones, cakes and pastries, served with one of our fine teas. A pot of tea for two, served with two warm home-baked scones per person, with lashings of West Country clotted cream and strawberry preserve for only a set £20 voucher. 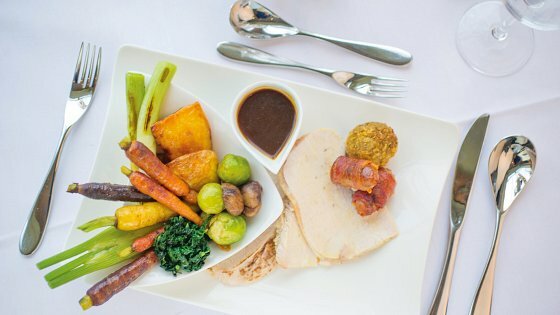 Our popular Sunday Lunch is served from 12.30pm to 2.00pm in our award-winning dining room. For only £45 you can treat two people to a mouthwatering 3-course lunch and coffee in the Bay View Restaurant. This special voucher is also found on our Vouchers Page. This one is for the golf lovers in your life! 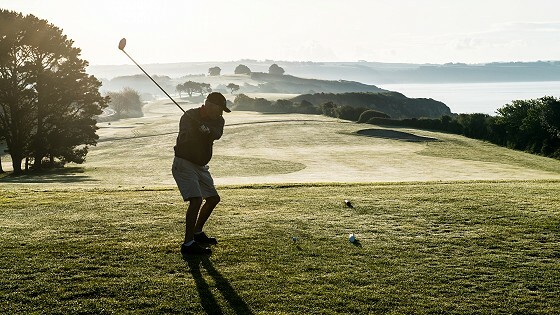 For a £55 voucher, you can cover their Green Fee when they enjoy a round on our 18 Hole, Par 72, Championship Golf Course - situated along the clifftops overlooking St Austell Bay. It includes one round of golf but excludes buggies, equipment hire, food and drinks. Why not combine with a spa voucher for couples? He can play golf, whilst she indulges in the spa. Or maybe add some monetary vouchers to turn someone's visit to Carlyon Bay into a complete stay? Pop to our Vouchers Page to purchase. Congratulations, you now get the joy of arranging your visit - contact us to discuss how and when you spend your voucher. If you are looking for accommodation for a Cornish break, see our latest offers to make a monetary voucher go as far as possible. If you wish to dine in style or would like to arrange an Afternoon Tea or Cream Tea experience, call us directly on 01726 812304 to book.